Securing your privacy has never been more important than it is now for several reasons. Not only does the average computer user need to protect data from hackers and viruses, but the NSA’s PRISM program is still active and ISPs are now allowed to spy on you, too. It seems there are endless ways for third parties to capture your data. Even if you use a cloud storage service that encrypts data during transport and storage, it’s possible for cloud storage employees and hackers to access your data (with the exception of zero-knowledge providers). Unfortunately, some services like Dropbox are notorious for poor security practices that make data easier for hackers to pluck than low-hanging fruit. In the past, the solution was simple: just use TrueCrypt to encrypt data before shipping it off to the cloud for storage. The problem with that solution is, however, that TrueCrypt has gone the way of the dinosaur and is now defunct. Contact Us to book an appointment or to discuss your needs further. Last year I posted about a great Microsoft Free Ebook giveaway. Well it’s happening again! I have updated the script that can download all the books for you. There seemed little point in changing the instructions as they are the same as before and so below this short intro you will find a link to last years posting that has full instructions. Eric Ligman – Microsoft Senior Sales Excellence Manager – puts his collection of Microsoft books online for anyone to download. These are PDF’s of the full books that would cost a small fortune to purchase. This is from an official Microsoft Blog and is sanctioned by Microsoft. We are often asked to build websites for our clients and friends. Though we are more than happy to do so we felt it was only fair to life the vail on how simple this can really be using tools such as WordPress. Websites can be extremely complicated (Facebook, Google, Pinterest) or extremely simple (http://www.graftonbespoke.com). But most fall somewhere in between and so today I will be showing you how to go down that road. Do remember that simple websites can get complex very quickly and there is often a great deal going on in the background to make things look simple. Manually code it: Time consuming. Needs a lot of skill. Need to know HTML, CSS and PHP or J# et al. VERY flexible. Use a site builder. Wix, 1&1: Very simple. Very limited in what you can do. Restrictive. Use a CMS (Content Management System): Slightly more complex than site builders, but much more flexible. Look and feel can be changed very easily. Many free templates available. There are a whole load of other ways of doing this, including buying a canned “White label” website. That is a system (often very complex) that you install and then customize to your needs (time entry, CRM…). Put in your email address, a user name (use the one it suggests) and a password (make a simple one up for now, although it is best to use a strong one (Tips for creating a Strong Password). Well done. You have created a website. Log in to the page that comes up. Take a look at https://haggisweb.wordpress.com/ (If it still exists) I created it this morning while preparing for this session. As you can see it is full of place holders. They need replacing with real information. Remember that WordPress was originally a blogging platform, so it tends to display as such. It is not hard to make it a “normal” website. Once you know what to look for you will be amazed the sites that are based on WordPress. One of the great things about WordPress is the staggering amount of plugins that are available (many for free). Plugins add features (sometimes very complex ones) to your site, without you needing to code. Take a look at “Infinite Scroll” and “Essential SEO”. If you find this interface a little restrictive add “wp-admin” to the end of your address (http://haggisweb.wordpress.com/wp-admin) and you will have access to the full WordPress dashboard. From here it is up to your imagination. Having a website is pointless unless you now that people are actually looking at it. Select “Analytics” from the settings menu. Here you can put in a Google Analytics Tracking ID. To get this go to http://www.google.com/analytics/ log in with a Google account (create one if you do not have one). You can then add your new site and you will be given an ID. Enter that ID into your new website. It will take a little time, but eventually you will be able to see who is looking at your site, where are they from, what are they looking at and loads more info. Have a play. See what effects you can have. It is hard to break it and even if you do break it it is not hard to reset. There is obviously a lot more that goes in to a website in terms of connecting it to social media and other services, but remember CONTENT IS KING. Make it interesting, show your passion and the followers will come. Here are some websites that we have built for our clients. Steve Gibson is a well know, sometimes controversial, technology commentator and producer of some great tools and freeware. He has produced a tool that will prevent your PC from upgrading to Windows 10. I have copied the words from his website, but I suggest you go to the source for the tool. whether their Windows 7 or 8.1 will upgrade itself to Windows 10. The name “Never 10” is a bit of an overstatement, since this utility may also be used to easily re-enable Windows operating system automatic upgrading. But the primary reason for using this is to disable Windows’ pestering insistence upon upgrading Windows 7 or 8.1 to Windows 10. Many users of Windows 7 and 8.1 are happy with their current version of Windows, and have no wish to upgrade to Windows 10. There are many reasons for this, but among them is the fact that Windows 10 has become controversial due to Microsoft’s evolution of their Windows operating system platform into a service which, among other things, aggressively monitors and reports on its users activities. This alone makes many users uncomfortable enough to cause them to choose to wait. In line with this, a few months into 2016, Windows 10 started displaying unsolicited advertisements on its users’ desktops. Others dislike the changes Microsoft made by merging their failed “tiled” smartphone user-interface into the Windows UI. And, finally, some object to being force-fed whatever Microsoft wants and simply wish to choose for themselves. In July of 2015, responding to the significant user backlash, Microsoft added features to its Windows Update facility which allow it to be configured, on a machine-by-machine basis, to not forcibly upgrade qualifying Windows 7 and 8.1 operating systems to Windows 10. However, Microsoft did not make this configuration simple. It requires the use of the group policy editor (which is not present in some qualifying systems) and/or the system registry. In other words, they created some deep internal configuration options but chose not to provide a simple user-interface to give their users the choice. “Never10” provides that choice. performs the required system editing for its user. If the system being configured has a version of Windows Update which is older than the required July 2015 release—which would mean that the required “upgrade disable” options are not yet present—this utility will notify its user (see the sample display screens above) and offer to download and install the required update to Windows Update so that Windows can then be configured not to upgrade itself to Windows 10. Since this utility simply updates and/or configures the system to prevent or allow, OS upgrading, it may be deleted after it has configured the system appropriately. Using this utility, inexperienced users will be able to easily use Never10 themselves, while advanced users will likely appreciate that fact that no additional software is installed and will be able to refer friends and family, whom they support, to this easy-to-use utility. 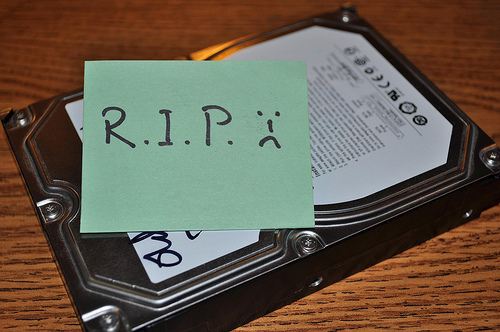 I have recently read a posting by someone that gave “10 Things You Should Not Do To a Failed or Failing Hard Drive”. Unfortunately 8 out of the 10 things suggested were bunk and were intended to point the poor owner of a damaged disk towards the recovery services offered by his company. This has spurred me on to give some better advice. The best thing you can do if you have a disk failure is to plan for it in advance and be prepared! I have recently swapped the spinning disk in my laptop for a Solid State Disk (SSD), this is essentially a box filled with non-volatile memory that replaces the existing disk. It is very fast, uses less power and is more tolerant of knocks (which is good as it goes on the back of my motorbike). The downside of an SSD is that they can sometimes just die. No warning, no funny noises, no apparent reason. I have taken an image of the hard disk, which I keep in a safe place. If I ever need to use it it will be badly out of date and I will need to spend some time updating it and making any tweaks I have done after the image was taken, but it will still be quicker than starting from scratch. I have copies, in a known location, of all the software I have installed. All the disks that came with the machine and recovery disks that I had to create along with another disk containing additional software and Licence information. I am sure there are one or two small programs that may be missing by now, but all the important line of business stuff, such as MS Office are secured. Now we talk about the important stuff that cannot simply be regenerated, namely, YOUR DATA. All my data is protected using a “belt and braces” approach, this is because I have lost data in the past and really do not want to do it again (if you have lost data you will understand). My method is a hybrid of the 3-2-1 approach that I have talked about in the past. I use Carbonite to give me a continuous back up of ALL the live data on my machine (Full disclosure – we are Carbonite resellers, please substitute the name of any offsite-online backup company you prefer). As long as I am internet connected, or as soon as I become internet connected, my data is off to a bunker in the US somewhere. I also use BOTH Cubby and MS Onedrive (both free) to replicate my most important business and personal information, this serves the triple purpose of a, giving me 2 more backups, b, allowing me to get to my data when I am away from my laptop and c, allows me to share my data with my business partner. Lastly I do also take backups to a local disk but, as with most normal people, this is not done as often as it should be. I do run regular disk maintenance and manage my laptop to the nth degree, but I am a techie and I am not suggesting that you need to do the same. With all these measures in place a disk failure is more of a nuisance than a tragedy. All I have to do is acquire a replacement disk, restore the image I took, update it and restore my data (which is always available, even with my machine down). Now I am not saying that this is the work of 5 minutes. It will still take a couple of days to get back to a fully operational state, but at least I do not have to worry that I have lost all the information for that major invoice I was about to send to my important client. As a slight aside, I have recently read an article that talks about Google. They have, not surprisingly, a massive amount of hard disks to store all the data about us. They early on realised that disks, even expensive specialist server disks, fail. They buy cheap consumer level disks and bank on approximately a 10% failure rate (that was a while ago and this figure may have changed). They then design their systems so that any individual disk failure is not an issue. What I have not told you is what to do if you do suffer from disk failure, and do not have a backup. The simple answer is, if you know what you are doing, attempt to take an image of the disk, if you can, BEFORE doing anything else. If you are not sure about how to do this then locate someone that knows what they are doing (preferably NOT your neighbours 12 year old). Much like Schrodinger’s cat, your data is there and is not there. A few wrong moves and your data will be damaged and then you will need a specialist company to recover it (= Expensive). Any experienced IT professional should be able to image a disk for you. If it will not read at all then you are in the hands of specialist companies. At this point you need to decide how much the data is worth to you and exactly what you need recovering. While we can’t all be set up like Google, we can be set up to expect hardware failure and be ready to recover with minimal loss. A stitch in time saves nine. Barclays wants to give you some security advice…. Unfortunately it is not very good…. • a website is secure before entering account or card details. Look for the ‘https’ in the web address and the padlock or unbroken key icon at the top of the page. • your personal or security information on a website you’ve clicked to from a link in an email or text. We will never email or text you a link that takes you straight to the Online Banking page. WRONG!! Never click on link in email or text in the first place. It is trivial to hide the real address that a link is taking you too (in an email or even on a website). If you want to go to a site obtained from an email, type the address YOURSELF. That way you know it is what it says it is. OK, this last one is fair comment. But don’t assume that the scanner will save your bacon. You need to take care where you go and what you click on. Look here Keeping safe on the internet for more tips. If you move your mouse over that link, and look in the bottom left of your browser window, you will see where it is taking you. The link on this page lets you download the books individually or download a file with links to each book. This is a bit of a pain as there are over 200 of them, so I have written a script (nothing clever just a bunch of wgets) that will download the whole lot (one by one). Right click on this link and select “Save as”. Make sure the name you save it as ends in .CMD NOT .TXT (Just remove the .TXT I have added). You will need to either use a machine (Linux or Mac??) that already has wget or install it on your Windows PC (it is actually a really useful tool). Once it is installed make sure that you have the location of the wget.exe in your machines search path and then create a new folder. Put my script in it and then click on it. It will open a Dos box up and start to download the files one, by one. Depending on your internet speed this may take some time. It is not a clever script and so, if you stop it and re-run it, don’t be surprised if you get the odd error, because files already exist. Also you may find that the Microsoft server may say that you already have a connection (just leave it for a while and try again). If you have any issues, drop me an email. But this really is as simple as it looks. Follow these simple steps (the digital equivalent of locking your front door and not leaving your keys in the car) and you can avoid 85% of the most common digital threats out there. Can you tell me anything about Livedrive? My backup man says he wouldn’t trust it with his data and my computer man swears by it. I am currently on it, but would prefer to have my data a bit nearer to me. I can’t tell you about LiveDrive specifically, as I have never used them. However having looked at their website I can tell you that they say all the right things. Unlimited, Data stored in UK, apps so you can get to your data from anywhere. They imply that they do versioning of files, but it is not clear if you can access the versions directly or if you have to ask LiveDrive to provide previous versions. Your IT man is correct and your backup man needs to move in to the 21st century. Tell him to go to the library and get a book about this strange thing called the “Internet”. I hate to be rude, but it amazing how many IT folk are burying their heads in the sand and hoping the internet will go away, instead of embracing it and the opportunities it provides. My documents folder is replicated to Microsoft One Drive and to Cubby (this has the benefit of ensuring that a, my business partner and I always have the same files to work on and b, there is always a copy on my business partners laptop as well as mine (and yes, he uses Carbonite as well)). Please see this short blog entry about how this setup saved my bacon! What are your concerns and why do you want to have your data near you? I will try and address major concerns below and hopefully cover yours. Is the data secure? That depends on what you mean by secure. If you mean “Safe from Loss”, then yes. Typically the backup provider will have data centres in secure locations and will duplicate your data on more than 1 location. If you mean “Can the backup provider see my files” the answer is “it depends”. With the provider I use (Carbonite) the data is encrypted from me to them. I believe it is encrypted on their servers. I have chosen to let them manage the keys, which allows me to use the apps to access my data from anywhere. I do have the option to manage the keys myself. This means that they CANNOT see any of my data, but also means that a, I cannot use the apps they provide and b, I have to manage the keys (if I lose them I am in deep trouble). How quickly can I get to my data? Well. That is dependent on your internet connection and how much data you have. Some backup providers will ship you a DVD or disk with your data on (for a fee). This is where a local backup helps. In short Internet Backup Good! for managing your kids passwords too. I run more than one antivirus program? protection less effective—or not effective at all. you from accessing your desktop. do I have to update my email account information? associated with their account is correct and up to date. Newsletter from Microsoft and its family of companies, please click here.